Exploring a national park is an adventurous idea any time of the year, but winter is unique because of plunging temperatures that change everything from how you prepare for the journey to what you will witness. The completely different perspective of the wilderness is worth every effort. 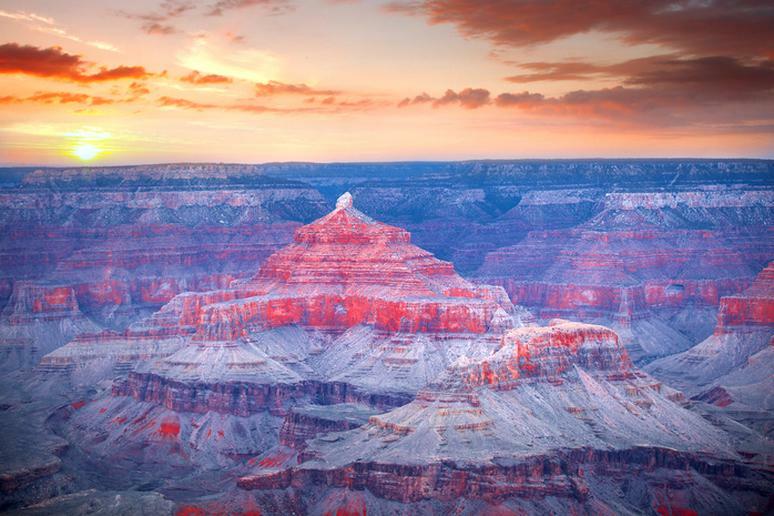 The Grand Canyon sits atop many of adventurers’ bucket lists, and visiting it in wintertime is a definite. Snow storms top the canyons in a soft white snow that bounces light, creating one of the most incredible sunsets you’ll ever see. Misty mornings on Bridal Veil Falls in the park are a rare beauty. Visiting any place in the park during the winter is a time of snow and solitude. 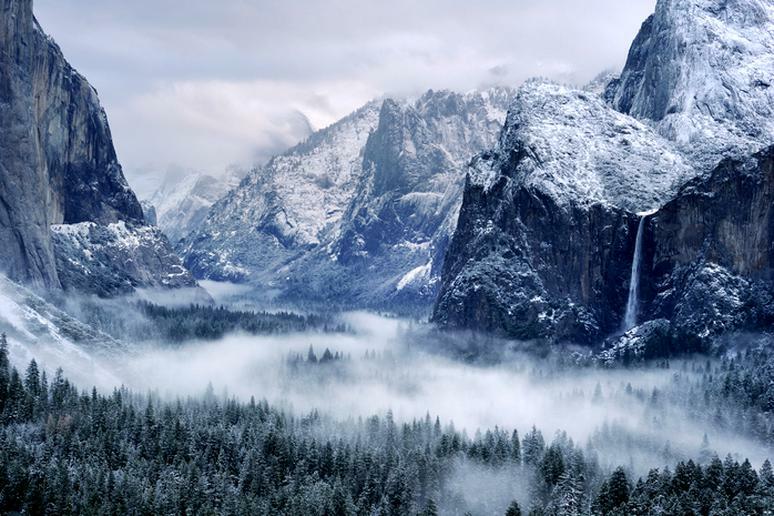 See the wildlife in its peaceful glory and experience the absolute magic of Yosemite Valley and Falls. If there is one place that you would not recognize if you went in the winter and summer, it would probably be the Grand Teton National Park. You can see snow covering the landscape from November to May. Go on a ranger-guided snowshoe walk. Cross-country skiing is popular and skiers are not restricted to established trails. 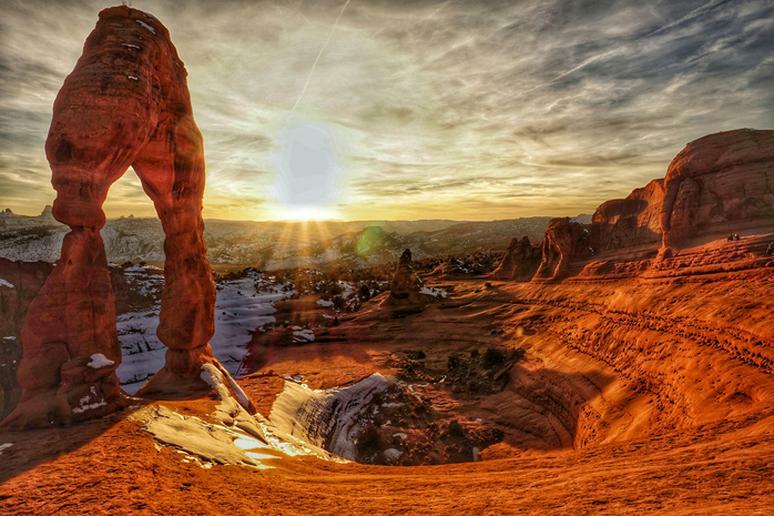 Have you seen arches and red rocks sparkle with ice and snow contrasting the clear blue sky? This natural phenomenon doesn’t happen in a lot of places. Most hiking trails remain open year-round. Ranger-led hikes are not offered in the winter but you can go camping. 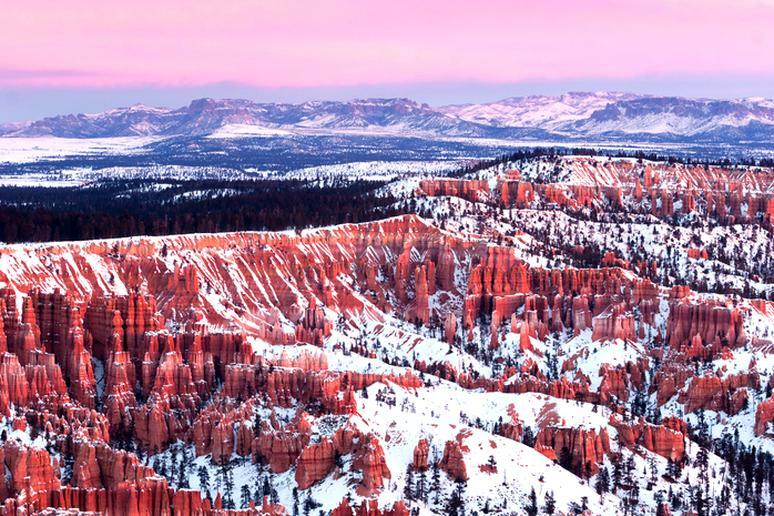 Bryce Canyon National Park is arguably the most beautiful during this time of the year. 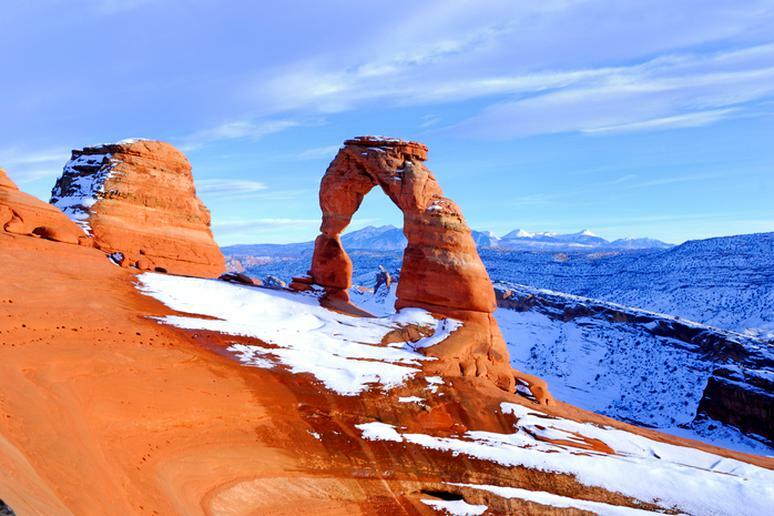 With the stunning contrast of red rock among white snow and bright blue skies, it is a surreal experience. Enjoy a snowshoe planet walk or try some cross-country skiing on the Red Canyon Bike Path. 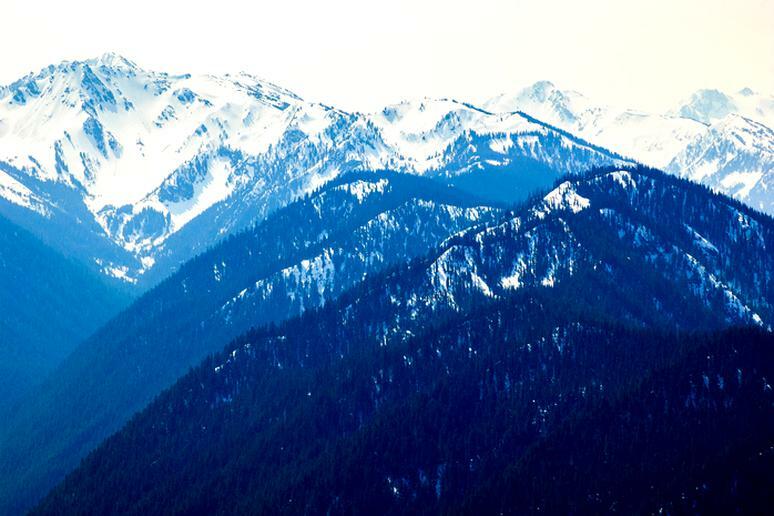 Take a peek at the Table Mountain Pines covered in snow among the Appalachian Mountains. 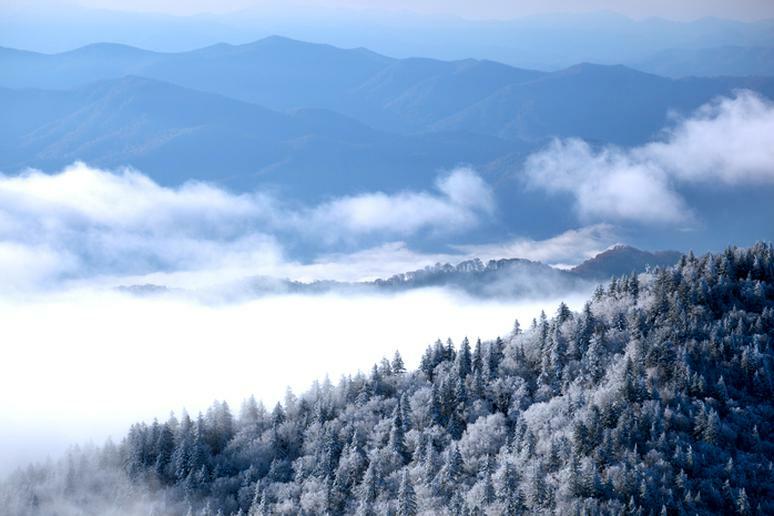 The Smokies are gorgeous in the wintertime, like a scene straight from a movie. The wildlife is abundant with a record number of Elks and more. 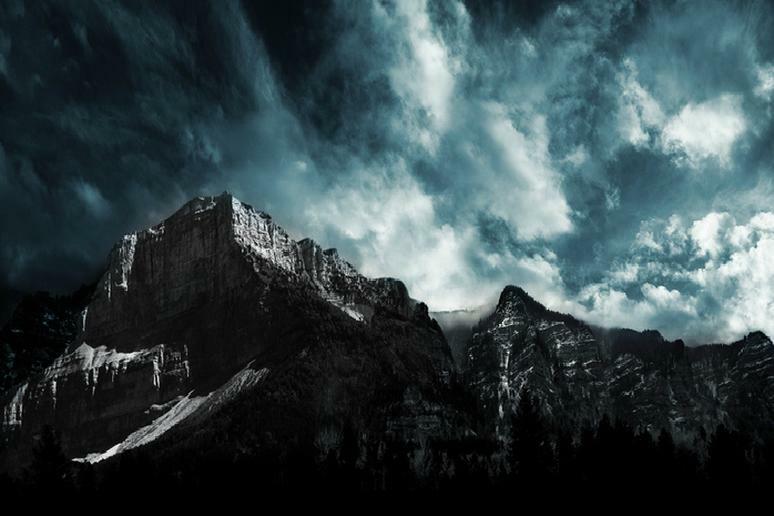 Hikes that are not too hard and low elevations provide comfortable conditions. Winters are mild here because of the maritime climate, heavily influenced by ocean currents. The park covers 3.3 million acres of jagged mountains, dynamic glaciers, temperate rainforest, wild coastlines and deep sheltered fjords. 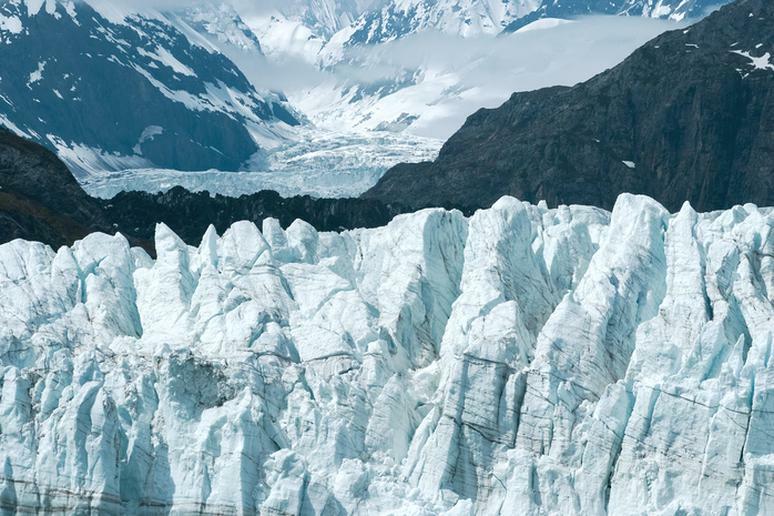 The Margerie Glacier (pictured), which is 21 miles long and 250 feet high, is one of few glaciers that are actually advancing. 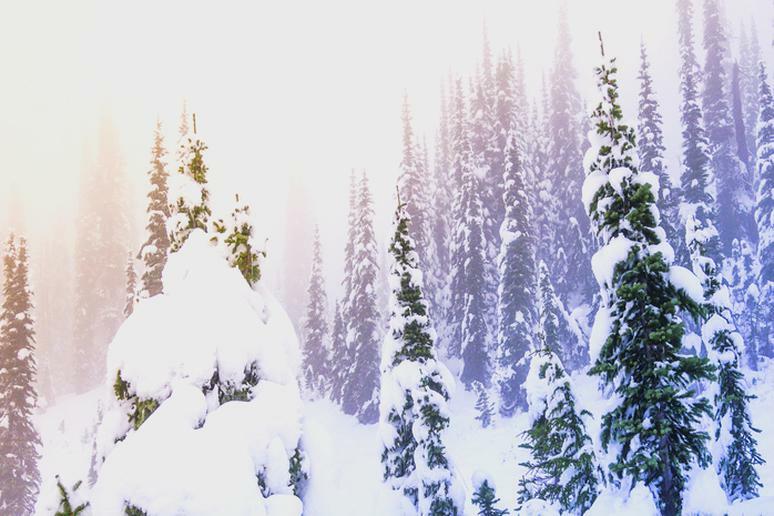 Winter looks like wonderland after a snowfall at the Mount Rainier National Park. 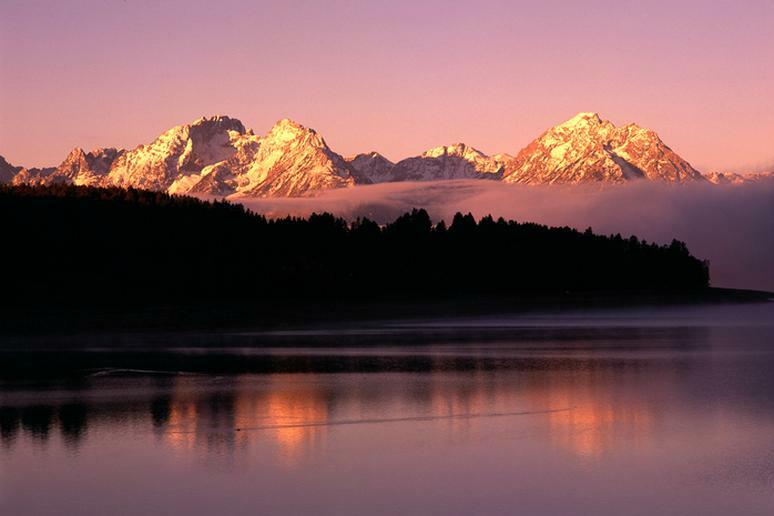 With fresh white snow, and glaciers galore, you won’t want to miss this beautiful scene. There is always a lot of snow there which makes the ranger-guided snowshoe walks, camping, snowboarding and skiing all the more fun. The hot springs pool in Midway Geyser Basin in Yellowstone is unique this time of the year. But this is not the only attraction. The variety of activities you can engage in – that don’t include skis – is enormous. 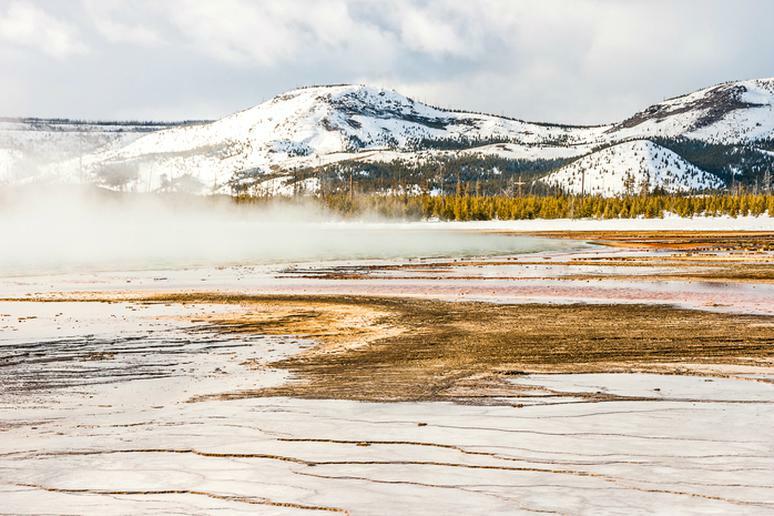 Take a sleigh ride through an elk herd in Jackson Hole or watch wolves in Lamar Valley; cut a Christmas tree; dip in a hot spring inside the park; and camp at Mammoth Campground. 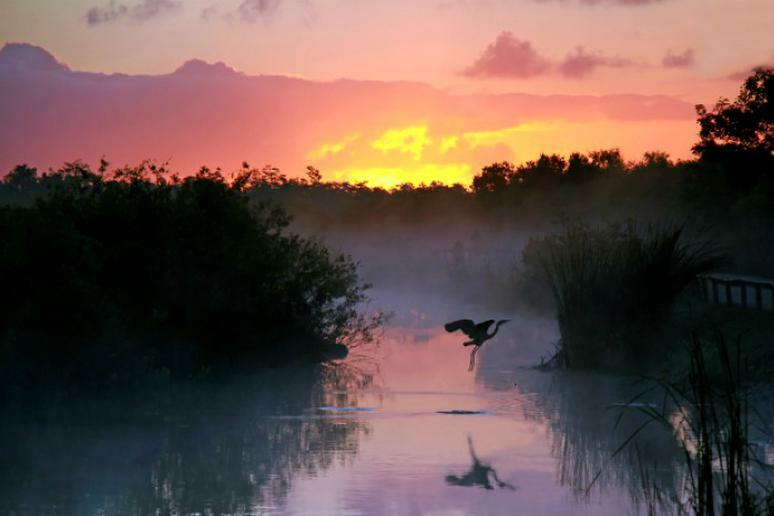 Migratory birds and mild temps settle in, making the wildlife-rich, waterlogged Everglades the perfect winter sanctuary for canoe campers. Set out along the 99-mile Wilderness Waterway, which weaves through mangroves from Everglades City to Flamingo, and is lined with 40-plus backcountry beach and chickee campsites. Olympic in the winter is really three parks: It's a lush rainforest, ripe for hiking at low elevations; it's a winter wonderland where skiers seek out hidden stash and snowshoers find solitude on 20 miles of trails high on Hurricane Ridge; the Pacific tosses giant driftwood logs noisily against the rugged shoreline out on the coast. This park has the tallest dunes in the country. So go snow camping near them and try sledding or skiing on the dunes in the winter. It’s always peaceful there this time of the year. You may come across deer or elk in their natural habitat. It’s also almost always sunny but very cold. 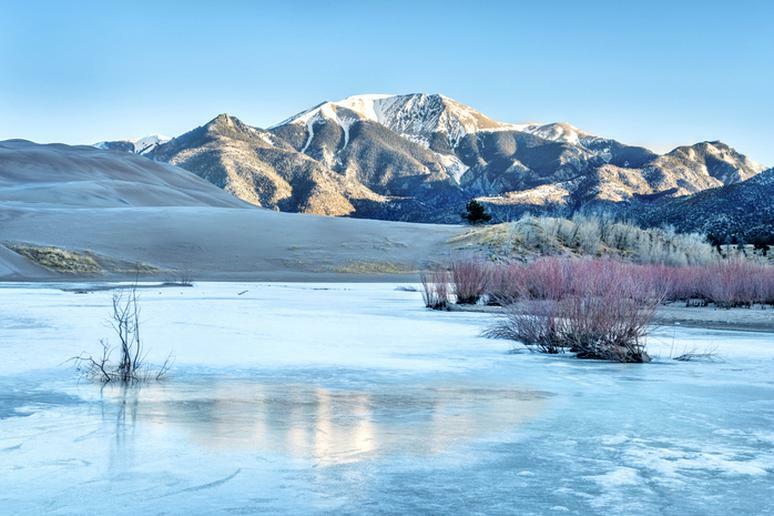 For a scenic adventure, Rocky Mountain National Park is the perfect place to explore in the wintertime. From snowshoeing through the backcountry to sledding in Hidden Valley, there is fun for everyone. Many Elk, Mule deer, and Moose can be seen around the park during this time of the year as well. 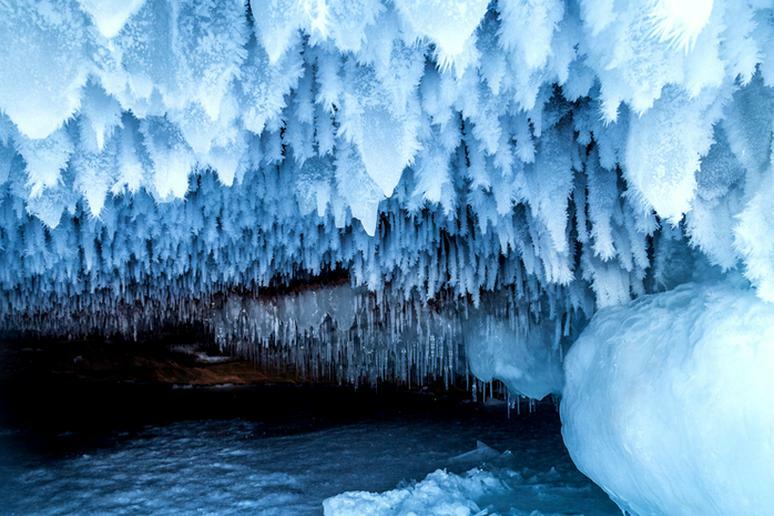 Want to see some amazing ice caves? Get on Route 13 from Duluth and head to Apostle Islands National Lakeshore. Visiting the caves in the winter requires at least a 2 mile hike (round trip) on the ice of Lake Superior, according to NPS. Come winter, the 30-mile, tourist-choked loop of the Rim Road is a deep and wild backcountry playground. 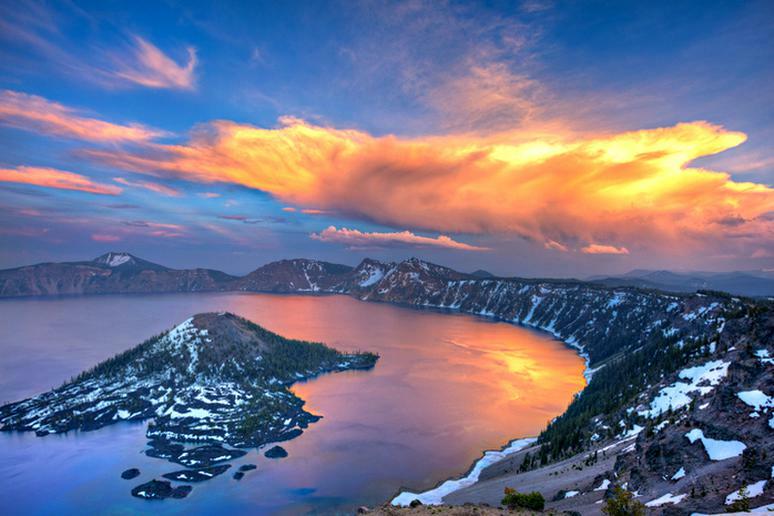 Adventurers can embark upon a three- or four-day ski tour of the caldera’s rim, soaking in the impossible blues of the nation's deepest lake at a civilized pace.